The aim of this study was to compare the effects of conventional radiofrequency (CRF) versus pulsed radiofrequency (PRF) in the treatment of idiopathic trigeminal neuralgia pain. The treatment of idiopathic trigeminal neuralgia (ITN) is often a challenge in clinical practice. Nowadays, radiofrequency (RF) is one of the most effective options for treatment. A comparative study was carried out in Menoufia and Zagazig university hospitals. Overall, 40 adult patients suffering from ITN were randomly assigned to two groups (20 in each). The CRF group was treated with CRF and the PRF group was treated with PRF. There were significant improvements in both groups as regards Visual Analog Score and Patient Satisfaction Score, which was higher in the CRF group at 6 months of follow-up. The possibility of repeating RF was higher in the PRF group than in the CRF group. Both CRF and PRF are effective in relieving pain associated with trigeminal neuralgia. PRF appears to be a relatively safe and effective procedure in the treatment of persistent pain of ITN in a shorter duration compared with CRF. Trigeminal neuralgia (TN) was recognized as a unique medical condition for many years, and no ideal therapeutic option has been emerged to treat it . There is a hypersensitivity to non-nociceptive stimuli . TN is the most frequently occurring type of craniofacial neuralgias . The incidence of TN is eight per 100 000 people and the peak age of onset is 50–60 years, with a slight female predominance. The pain is usually unilateral and associated with a cutaneous trigger zone, and it is severe enough to affect the quality of life. TN has been classified into two categories: idiopathic trigeminal neuralgia (ITN) and secondary TN. The clinical treatment of ITN is often a challenge due to the controversy as regards its etiology . The rapid and correct diagnosis is very important to determine prompt institution of treatment because the symptoms are so severe. For patients in whom medical treatment fails to control pain, microvascular decompression, glycerol rhizolysis, radiofrequency thermocoagulation, and percutaneous trigeminal microdecompression procedures have been used in an attempt to alleviate ITN . The treatment of patients with ITN is often a challenge in clinical practice. When the pharmacological treatment fails, a choice between minimally invasive technique and a surgical approach should be made. By far, one of the most common procedures to treat pain is the use of radiofrequency (RF) lesioning. The main advantages of RF seem to be its effectiveness and high pain relief rate without the dangerous complications of surgical procedures  and lack of secondary effects and reduction of oral medication . Lesioning using RF current has been increasingly used in clinical practice for the treatment of pain syndromes. Although formation of heat causing 'thermocoagulation' of the nervous tissues is thought to be responsible for the clinical outcome, a more recent modality of RF application named pulsed radiofrequency (PRF) delivers the RF current without producing destructive levels of heat . RF thermocoagulation has become the most common procedure for treating TN. Microvascular decompression and partial sensory rhizotomy have a lower risk for recurrence but a higher risk for complications requiring hospitalization . The aim of this study was to compare the effects of conventional radiofrequency (CRF) versus PRF in the treatment of ITN pain. The study was conducted after approval of the local ethical committee of Menoufia Faculty of Medicine and after informed consent was obtained from patients. TN is a rare disease, which was a limiting factor, and hence we selected a comprehensive sample of patients. All patients who met the inclusion and exclusion criteria were included. 40 patients were included during the study period of 5 years (duration of the study). Patients were selected from among those presenting to the pain clinic in both Menoufia and Zagazig university hospitals. Patients were randomly assigned to one of the two treatment groups (20 patients in each group). Patients in the CRF group were treated with CRF, whereas patients in the PRF group were treated with PRF. All procedures were performed in the operating room. Thereafter, baseline data for each patient were assessed and recorded. After sterilization, very light sedation with intravenous propofol 0.5 mg/kg and midazolam 0.01 mg/kg was maintained, so that the patient is able to collaborate when the test stimulation is being performed. Local anesthetic injection of 2% lidocaine was carried out at entrance point, which is located under fluoroscopic guidance. After the stimulation period, the patient was given 1 μg/kg fentanyl and 1–2 mg/kg propofol. The procedures were performed under fluoroscopic control in submentovertex projection with caudal inclination of ~30°–45°. The direction of the needle was verified under fluoroscopy in submental, lateral, and anteroposterior views. Trial stimulation:First, sensory stimulation at 100 Hz was performed with 0.1–0.5 V to search for a tingling sensation at the affected branch, which is the trigeminal nerve branch innervating the trigger zone. During the sensory stimulation, the patient was awake to respond to the stimulation. As a second step, motor stimulation was performed using 2 Hz with 0.1–1 V, and the muscle contractions were observed. In the CRF group, after motor and sensory stimulation, RF lesioning was performed at 60°C for 60 s. The patient was then allowed to recover from intravenous propofol and tested for reduction of response to pinprick stimulation; the area of analgesia created will contract, and hence the aim was to produce an area of reduction of response to pinprick sensation, which is slightly larger than the area of the patient's pain. We continued to lesion in 5°C increments for 60 s until we reached a maximum of 80°C for 60 s. At each stage, the patient was allowed to recover from the intravenous propofol, and we tested for reduction of response to pinprick stimulation. If we were lesioning the first division of the TN. Thereafter, the sensitivity of the face and cornea was tested. In the PRF group, a PRF current at a dose of 500 pulses was given to the affected branch, and then we tested the affected area for severity of pain. If the pain was still present, we gave another pulsed dose, and then we examined for pain relief until we covered beyond the trigger area and did not exceed a temperature of 42°C. Patients were evaluated as regards their pain intensity using VAS, patient satisfaction using Patient Satisfaction Scale (PSS), the need for additional pharmacological treatment, side effects, complications, and the need for repeating the use of RF treatment. The data were tabulated and analyzed using Statistical Package of Social Science program, version 11 (released September 2001; SPSS Inc., Chicago, Illinois, USA) and IBM SPSS statistics for windows, version 11.0 (IBM Corp., Armonk, New York, USA) using personal computer. Qualitative data were expressed as number and percentage and analyzed using χ2-test. Quantitative data were expressed as mean ± SD and analyzed by using the t-test. Results of the present study demonstrated that there was a statistically highly significant difference as regards VAS at different stages of follow-up after CRF when compared with pretreatment stage [Table 1]. Moreover, there was a statistically highly significant difference in VAS between different stages of follow-up after PRF when compared with pretreatment stage [Table 1]. There was a statistically significant difference between the two groups as regards the presence of complications on the first day, at 1 week, at 1 month, and at 3 months after treatment. There was no statistically significant difference between the two groups as regards the presence of complications at 6 months after treatment [Table 2]. There was no statistically significant difference between the two groups as regards the need for medical treatment after application of the two types of RF on the first day, at first week, at first month, and at 3 months after treatment. However, there was a statistically significant difference between the two groups as regards the need for medical treatment after application of the two types of RF at 6 months after treatment [Table 3]. 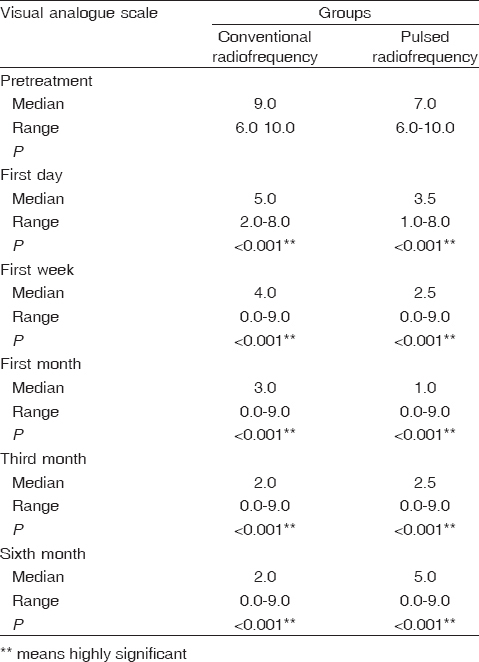 There was no statistically significant difference as regards the need for medical treatment on the first day and at first week when compared with pretreatment stage, whereas it was significant at first month and highly significant at 3 and 6 months when compared with pretreatment stage in case of CRF [Table 4]. There was a statistically significant difference as regards need for medical treatment at first week, and then it was highly significant at the first month when compared with pretreatment stage; again, it was statistically significant at 3 and 6 months when compared with pretreatment stage in case of PRF [Table 5]. Statistically highly significant difference between the two groups as regards need for repetition of RF [Table 6]. TN is described as the most irritating pain known to humanity . Various drugs and surgical procedures have been used for treatment . Despite numerous available approaches, the results are not completely satisfying. Multiple drugs are needed to control the pain. However, untolerated side effects occur, and hence a surgical procedure is required to treat. Pain recurrence after one or more surgical operations is also frequently seen. These facts reflect the lack of the precise understanding of the TN pathogenesis . Surgical and interventional procedures include glycerol injection, percutaneous balloon microdecompression, rhizotomy, thermocoagulation with RF, microvascular decompression, and gamma knife radiosurgery, all of which may be necessary when other treatments fail, but have different surgical risks . In the present study, a comparison was made between the CRF and PRF groups in the treatment of ITN. As regards pain relief, there was a significant improvement in VAS in both groups throughout the follow-up period; follow-up was scheduled on the first day, at first week, at 1 month, and at 3 months after treatment. This improvement continued up to 6 months in CRF patients. PRF patients showed a higher rate of recurrence of pain at this time point. Laghmari et al. stated that thermocoagulation offers the highest rates of complete pain relief; this is in agreement with the present study, as we found a highly significant difference in VAS scores at different time points of follow-up compared with pretreatment results. In agreement with the present study, Fraioli et al. documented that complete pain relief was obtained immediately after the procedure in all patients up to the third month follow-up; after that, pain began to reappear in the PRF group rather than in the CRF group. This is nearly the same with respect to patient satisfaction in the present study, as patients were satisfied in both groups until the 6 months Less satisfaction was observed in the PRF group; this may be due to the temporary effects of PRF on the nerve rather than the permanent changes caused by CRF. On comparing the studied groups as regards the need for medical treatment after application of the two types of RF, there were no statistically significant differences between the two groups on the first day, at 1 week, at 1 month, and at 3 months after treatment. There was a statistically significant difference between the two groups as regards the need for medical treatment after 6 months. Tun et al. reported that PRF treatment may cause separation in myelinated axons. However, it seems that all changes were reversible. This is in agreement with the results of the present study, as we found that the effect of PRF fades after short time and we found a significant statistical difference as regards the need for medical treatment and repetition of RF in the PRF group compared with the CRF group. The present study supports the hypothesis that pulsed RF treatment does not rely on thermal injury of neurologic tissue to achieve its effect. Comparison between the studied groups as regards the need for repetition of RF showed a statistically highly significant difference between the two groups. We needed repetition of the procedure for 12 patients in the PRF group after 6 months of follow-up; Fraioli and colleagues repeated the procedure in 10 patients. Eduardo et al. confirm that CRF for ITN has shown high success rates, with significant residual morbidity. This is in agreement with the present study in the CRF group. They state from their experience that patients who had recurrences were quite willing to undergo the procedure once again because they knew it is a painless ambulatory procedure with minimal risk. These studies should finally confirm that complications resulting from CRF in the treatment of TN can be easily avoided using the multiarray method and technique, which were developed attempting to update and fulfill Sweet and Poletti's technique. Li et al. stated that efficacy in pain relief was most significant on the seventh day after treatment, and this is in agreement with our results in both groups. There were no significant differences between groups after 12 months . This is different from our results as there were statistical differences between the two groups at 6 months, which may be due to the use of PRF for 10 min and in a pulsed manner for 2 min only. The intensity of facial dysethesia was mildest in the short CRF group and most severe in the prolonged CRF group on the seventh day after the procedure that we noticed in CRF group but was improved in most cases by the sixth month . van Boxem et al. stated that randomized controlled trial indicates superiority of CRF over PRF for the management of ITN. We agree with Boxem as shown in the results of the present study. The study conducted by Erdine et al. showed that 1 day after the procedure the VAS scores decreased significantly in group 1 (CRF). We noted a similar result in the CRF group. The VAS scores decreased in only two of 20 patients from the PRF group (group 2) and these two patients had achieved considerable pain relief after the procedure. In the present study, VAS decreased significantly in the PRF group. The pain relief lasted 3 months and pain recurrence occurred after 3 months of the procedure. This is in agreement with the present study, in which recurrence occurred in the PRF group at 3-month and 6-month follow-up and there was an obvious increase in need for medical treatment. In addition, PSS improved significantly 1 day after the procedure in group 1; there were no significant differences in PSS values in group 21 day after the procedure. In our study, there was a significant improvement in PSS in both groups on the first day, on the seventh day, and at 3 months, but this PSS decreased in the sixth month follow-up in the PRF group. Overall, there was greater satisfaction in the CRF group compared with the PRF group at 6-month follow-up, but without statistical significance. Supervisor of the study decided to perform CRF in group 2, because they still had pain. In present study, we found that there was a need for repetition of the procedure after 6 months for only two patients in the CRF group and 12 patients in the PRF group, which showed high statistical difference between the two groups. The results of Erdine and colleagues are in agreement with our results as no complications were observed in the intraoperative period or in the early postoperative period. After the procedures, as a side effect, five of 20 patients from group 1 and three of 20 patients from group 2 reported moderate headache for 24 h. In all patients from group 1, there was mild hypoesthesia and parasthesias after the procedure. Anesthesia dolorosa occurred in one patient and medical treatment was given. In group 2, there was no parasthesias until after the application of CRF. Annoying dysethesia and other complications were not observed. Under the condition of the present study we can conclude that both CRF and PRF are effective in relieving pain associated with trigeminal neuralgia. PRF appears to be a relatively safe and effective procedure in the treatment of persistent pain of ITN. Unlike CRF, this is associated with neuritis-like reactions and motor deficits, whereas PRF seems to have transient side effects. Gorgulho AA, De Salles AA. Impact of radiosurgery on the surgical treatment of trigeminal neuralgia. Surg Neurol 2006; 66:350–356. Chakraborty A, Bavetta S, Leach J, Kitchen N. Trigeminal neuralgia presenting as Chiari I malformation. Minim Invasive Neurosurg 2003; 46:47–49. Kanpolat Y, Savas A, Bekar A, Berk C Percutaneous controlled radiofrequency trigeminal rhizotomy for the treatment of idiopathic trigeminal neuralgia: 25-year experience with 1600 patients. Neurosurgery 2001; 48:524–532. Huibin Q, Jianxing L, Guangyu H, Dianen F The treatment of first division idiopathic trigeminal neuralgia with radiofrequency thermocoagulation of the peripheral branches compared to conventional radiofrequency. J Clin Neurosci 2009; 16:1425–1429. Kaplan M, Erol FS, Ozvern MF, Topsakal C, Sam B, Tekdemir I Review of complications due to foramen ovale puncture. J Clin Neurosci 2007; 14:563–568. Erdine S, Ozyalcin NS, Cimen A, Celik M, Talu GK, Disci R Comparison of pulsed radiofrequency with conventional radiofrequency in the treatment of idiopathic igeminal neuralgia. Eur J Pain 2007; 11:309–313. Castro M, Vila S, Cánovas L, Delgado E, Centeno J, Illodo G, Vázquez A Pulsed radiofrequency: an effective alternative for the treatment of trigeminal neuralgia. Eur J Pain 2006; 10(Suppl 1):S136. Koopman J, DeVries L, Dieleman J, Huygen F, Stricker B, Sturkenboom M. A nationwide study of three invasive treatments for trigeminal neuralgia Eur J Pain Suppl 2010; 4:114. Cruccu G, Leandri M, Feliciani M, Manfredi M. Idiopathic and symptomatic trigeminal pain. J Neurol Neurosurg Psychiatry 1990; 53:1034–1042. Taha JM, TewJr JM. Treatment of trigeminal neuralgia by percutaneous radiofrequency rhizotomy. Neurosurg Clin N Am. 1997; 8:31–39. Lopez BC, Hamlyn PJ, Zakrzewska JM. Systematic review of ablative neurosurgical techniques for the treatment of trigeminal neuralgia. Neurosurgery 2004; 54:973–982. Laghmari M, El Ouahabi A, Arkha Y, Derraz S, El Khamlichi A. Are the destructive neurosurgical techniques as effective as microvascular decompression in the management of trigeminal neuralgia? Surg Neurol 2007; 68:505–512. Fraioli M, B Cristinob, L Moschettoni, G Cacciottia, C Fraiolia. Validity of percutaneous controlled radiofrequency thermocoagulation in the treatment of isolated third division trigeminal neuralgia. Surg Neurol 2009; 71:180–183. Tun K, Cemil B, Gurcay A, Kaptanoglu E, Sargon MF, Tekdemir I, et al. Ultrastructural evaluation of pulsed radiofrequency and conventional radiofrequency lesions in rat sciatic nerve. Surg Neurol 2009; 72:496–501. Eduardo A Karol B, Perez A, Cueto G. A multiarray mapping method to minimize morbidity from thermocoagulation as treatment of refractory trigeminal neuralgia. Surg Neurol 2009; 71:411–418. Li X, Ni J, Yang L, Wu B, He M, Zhang X, et al. A prospective study of Gasserian ganglion pulsed radiofrequency combined with continuous radiofrequency for the treatment of trigeminal neuralgia. J Clin Neurosci 2012; 6:824–828. Goadsby PJ. A review of paroxysmal hemicranias, SUNCT syndrome and other short-lasting headaches with autonomic feature, including new cases. Brain 1997; 120 (Pt 1):193–209. van Boxem K, van Eerd M, Brinkhuize T, Patijn J, van Kleef M, van Zundert J. Radiofrequency and pulsed radiofrequency treatment of chronic pain syndromes: the available evidence Pain Pract 2008; 8:385–393.